TEMPE, Ariz. - March 6, 2014 - PRLog -- Phoenix Analysis & Design Technologies, Inc. (PADT, Inc.) the Southwest’s largest provider of product development tools and services, is marking its 20th year of business on March 7th, 2014. After its founding in 1994 by four engineers, the company has grown to over 80 employees who provide products and services for simulation, product development, and rapid manufacturing to companies around the world. PADT focuses on providing world class engineering consulting as well as sales and support of leading mechanical engineering hardware and software tools from ANSYS, Inc. and Stratasys. Well known Arizona companies like Honeywell, Intel, Raytheon, Freeport-McMoran, Mayo Clinic, Rainbird, WL Gore, Orbital Sciences, SynCardia, and many others count on PADT as a valued partner, helping them meet their engineering outsourcing, prototyping, and software needs. After reviewing the past twenty years, Ward Rand, one of PADT’s four owners, commented: “When we started PADT, we just wanted to create the type of company that we would want to work for. A place where we could solve difficult engineering problems and apply the latest computer aided engineering tools. Twenty years later we are still eager to come to work, we are still using leading edge tools, and we learn something new every day. · - High employee retention, less than 0.5% annual attrition rate. · - Three offices: Headquartered in Tempe, AZ. Sales and Engineering in Littleton, CO, and Albuquerque, NM with telecommuting Employees in Utah, South Carolina, Maine, and Pennsylvania. · - One of the largest privately owned high performance compute clusters in the Southwest with over 2000 cores. 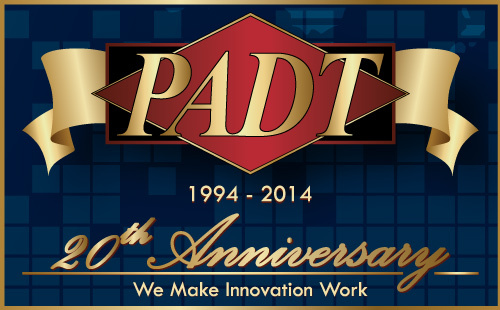 For more information about PADT’s 20 years of business and the event, visit www.padtinc.com/20 or call 480-813-4884.